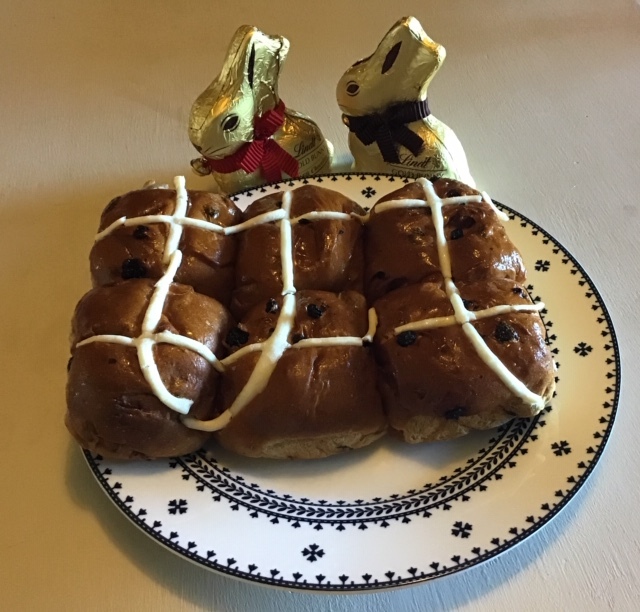 Hot cross buns are a yeasted sweet bun spiced with cinnamon, cloves and nutmeg, studded with raisins and then marked on top with a cross. Each part of the bun has a certain meaning with the cross representing the crucifixion and the spices supposedly signifying those used to embalm Jesus at his burial. The buns go back to the 12th Century and were traditionally only available just before Easter and were served only on Good Friday. "Back in the day" we had to pre order them at a bakery and pick them up on Good Friday eve. Our supermarket, Coles, has been selling its buns months before Easter for years. This year they really outdid themselves by having them on the shelves on Boxing Day! In protest of this crass commercialism, I imposed a purchase boycott until a few weeks out from the holiday. That has them quaking in their boots! While chocolate chip and fruitless buns surreptitiously snuck their way into the range a little while ago, this year has introduced variations flavoured with white chocolate and raspberry, sticky date and butterscotch, Belgian chocolate and cherry and banana and caramel. Coles competitor, Woolworths, has even launched a hot cross bun flavoured ice-cream. All I can say is BOOOOOOOOOOO! Just leave some things the way they are! I know....grumpy old man syndrome. I am very fond of old sailing ships or so called ‘Tall Ships'. There are around thirteen in Australian waters. But we don't see too many around here as our harbour is more than likely an unsuitable port. 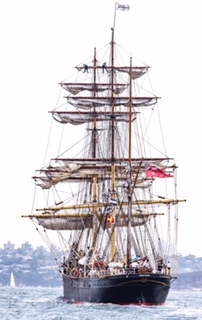 Among them is a replica of the Endeavour, Captain James Cook's 1770 vessel of discovery sailing around the country and then there is the James Craig, the genuine article, built in 1874 in the UK and originally named Clan Macleod. She carried cargo around the world and rounded Cape Horn 23 times in 26 years. In 1900 she was acquired by Mr J J Craig, renamed James Craig in 1905 and began to operate between New Zealand and Australia until 1911. She eventually fell victim to the advance of steamships and in later years was used as a collier and later laid up, then used as a hulk, until being abandoned in Tasmania where in 1932 she was sunk. Her restoration began in 1972, when volunteers from the Lady Hopetoun and Port Jackson Marine Steam Museum, now the Sydney Heritage Fleet, refloated her and towed her to Hobart for initial repairs. She was then brought back to Sydney under tow in 1981 and her hull placed on a submersible pontoon to allow work on the hull restoration to proceed. Over twenty-five years, the vessel was restored and repaired by both paid craftspeople and volunteers and relaunched in 1997. In 2001 restoration work was completed and she now goes to sea again. She is one of only four 19th century barques in the world that still go regularly to sea. James Craig is currently berthed near the Australian National Maritime Museum and is open to the public. 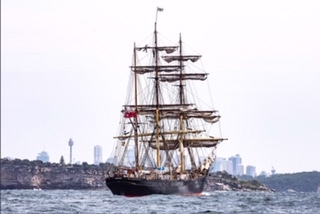 She is crewed by a compliment of 16 and maintained by volunteers from the Sydney Heritage Fleet. The cost of maintaining her approaches $1 million a year and the ship relies on generating income from visitors, charters, events, and regular fortnightly daily sailings with up to 80 passengers. She is always a wonderful sight. With the fire out, National Parks finally open the road to our beach so we decided to have a look at the damage. It was obvious when we got to the forested part of fire ground that the intensity of the fire had not been that great. It had not reached the tree tops and therefore not 'spotted' too far in front of itself. The road had been a natural fire break. It was a bit of a different story in the coastal heath up to the dunes near the beach. All the under storey and low lying bush had been burnt. But they had stopped the fire heading south to the camping ground and a reading spot (picnic table) was still there surrounded by green bush. The beach was as beautiful and pristine as always and looked great in the autumn morning light. And it was amazing to see that, with just that little bit of rain we had, regrowth had already started. 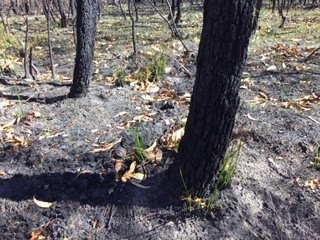 Many native Australian plants need fire to regenerate. Banksias are a prime example and a couple of species are prevalent in our coastal heath. Fire opens the hard cones and spreads the seeds which then germinate in the nutrient rich residue of the fire. It will take a couple of years and, apart from the blackened tree trunks, it will be difficult to notice that a fire has been through the area. Early on Wednesday morning, the co driver noticed smoke rising from the National Park over the highway. 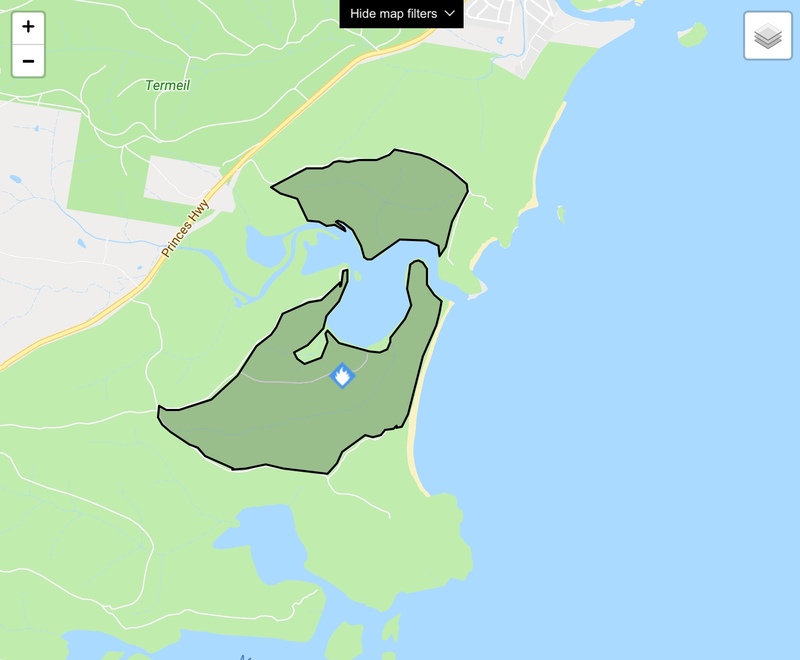 I check my Fires Near Me app and sure enough there was a small bushfire near the lake. We thought nothing much of it at first but as the morning passed it was evident from the increasing smoke that it was developing. Soon we knew we may have a problem on our hands. Luckily the winds were light and not blowing in our direction but it was obvious that it was getting bigger. The app map confirmed this. As darkness fell a huge red glow spread across the eastern horizon. Around 2am the next morning I awoke and the glow had turned bright orange and the light flooded our bedroom. I checked the map again and sure enough the fire had taken off, jumped the lake and was heading for the village to our north. They were under a yellow alert ie.initiate evacuation plan. The firefighters had lit a back burn on one of the fire trails just over the lake to combat the spread of flames, hence the intense light. A back burn is a deliberate fire lit in front of the bushfire along a natural (lake, river) or man made (track, road) fire break. This fire is then 'sucked' towards the bushfire by that fire's own air consumption, against the wind, eventually giving the more intense main fire nothing to burn. This stopped the northerly spread and the alert was withdrawn. Next morning, Thursday, the fire to the south east was still intense and due to a change of wind, heading towards us. Water bombing helicopters were continually flying over us to the fire. The app indicated that the firefighters were beginning a back burn along a track directly over from us and we were told by another source that the increased smoke this would cause should not be a worry. Helicopters continued their 'attack' until 7pm when the sun began to set. It was obvious from new app maps that the back burn had done the job but there was still an intense red glow in the sky during the night as the two fires met and burnt out. This morning, Friday, the smoke plumes had gone but the helicopters, en masse, are back helping fire fighters on the ground mop up. Fallen trees and burning logs have to be doused, especially around the perimeter, as any small fires left burning or smouldering can easily start a new fire if weather conditions change. How this fire started in cool, calm autumn conditions is anyone's guess. A campfire that got away or deliberately lit? The latter is sadly not unknown. 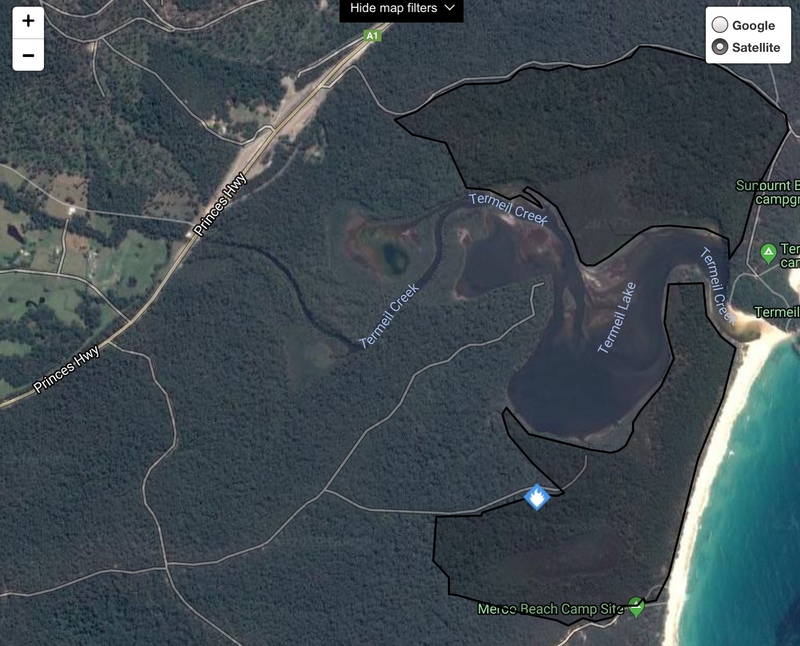 In any case, 220ha of National Park has been burnt out and a huge amount of beautiful wild flower habitat and native vegetation destroyed especially along the northern part of our beach. But thanks to the Rural Fire Service there was no property damage. Rain, up to 30mm, is predicted for tomorrow. No rain at all yesterday. Warm to hot and dry conditions predicted for the next week. There is no activity in the air over the fire ground but the roads in on both sides of the lake are still closed so assume they are still working on shutting it down completely. Today we are covered in smoke. 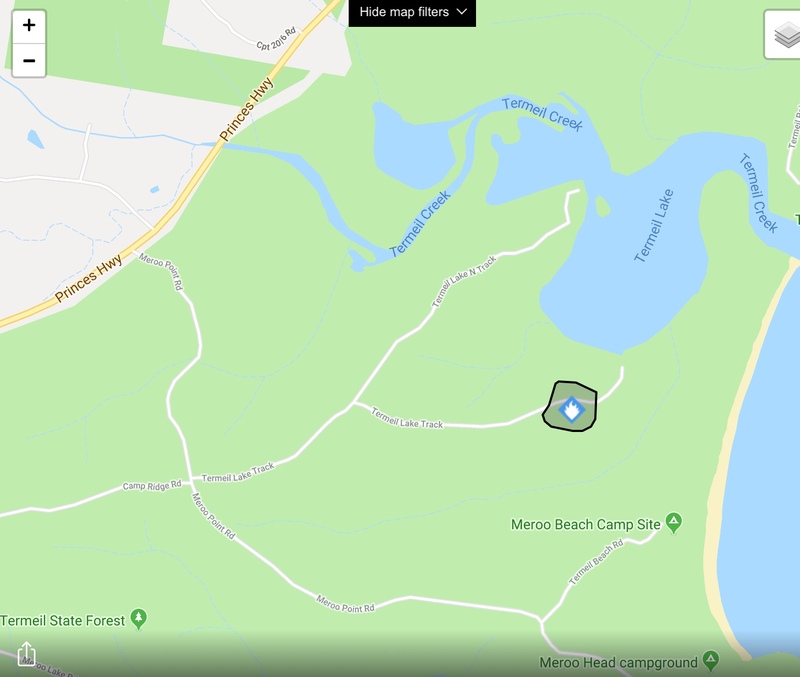 From the new app map it seems that the fire, while still under control, continues to be active as the back burns consume the last of the combustible material within the fire ground. 68mm of rain over 24 hours and the fire is finally out. This summer we have experienced more than our fair share of thunderstorms. They usually arrive late in the afternoon and put on an exciting light and sound show. Sometimes lightning strikes are very close. Our neigbour had some damage done to their entire electrical network and appliances due to one. What has been strange about this season is that while many have been accompanied by wind and torrential rain as is normal, many have not ie. dry storms. The other night we experienced around seven hours of continuous lightning and thunder. So what causes this high-voltage show and how can you track where it’s happening? Our Bureau of Meterology (BOM) says it begins within a developing thunder cloud. Within the cloud there are millions of tiny ice crystals and super-cooled water droplets rubbing up against each other as they move up and down. This causes a positive charge to develop at the top of the cloud and a negative charge at the bottom. The negative charge at the bottom of the cloud moves closer to the ground through a faint, negatively charged channel in a series of steps called ‘leaders’, while coming up from the ground are a series of positively charged channels known as ‘streamers’. When one of the positive steps connects with the negative streamer, a powerful electrical current races from the cloud to the ground, and this is when we see the lightning bolt. Lightning heats the air around it to a temperature of approximately 30,000 °C, which is hotter than the surface of the sun. This rapid heating makes the air expand extremely quickly in a shock wave that we hear as thunder. And how close is a lightning strike. Count the number of seconds between the strike and the thunder and then divide by three. The result is the approximate number of kilometers (divide by 5 for miles). Pretty scary as we have had lot of simultaneous lightning and thunder recently. The amazing pic used in this post is by photographer Maree Clout. 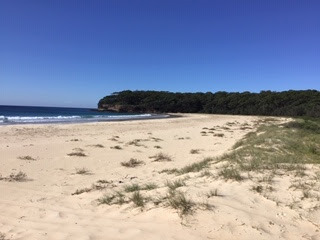 She has a Facebook site called Jervis Bay Through My Eyes which has some lovely photographs of our area. It commemorates the arrival of the First Fleet from Great Britain into Sydney Harbour in 1788 to establish a convict settlement. Not everyone is happy about this being a day to celebrate, especially the indigenous population. They see it as invasion day. Disquiet about the date has been building for some time now. Each year the protests get more vocal and visible. Sadly for a lot of people it is an opportunity for them to demonstrate their bogan racist, nationalistic and jingoistic attitude. Never a good look.....for any country. The events that take place on this holiday are largely organized by the local councils. They also are in charge of the many citizenship ceremonies that take place around the country. 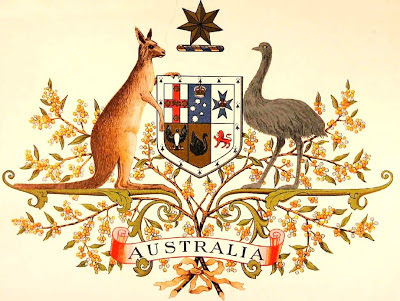 Some have decided not to celebrate the date at all while others have decided to keep the events but move the citizenship ceremonies away from the 26th. This has incurred the ire of our current turd of a Prime Minister who is threatening to remove citizenship ceremony rights from errant councils. Many are standing firm however. Our local council had moved the January ceremony away from the 26th a long time ago (there are three or four more during the year) without a murmur. The co driver took part in one three years ago. No one turned a hair that it was not on ‘the day’. They are one of those now standing firm. Hopefully this and many other much more important and worrying matters will be solved when the current vacuous government is voted out and into oblivion some time before May. Chianti is a wine region in Tuscany, Italy. It is famous for its red wine made mainly from Sangiovese grapes. 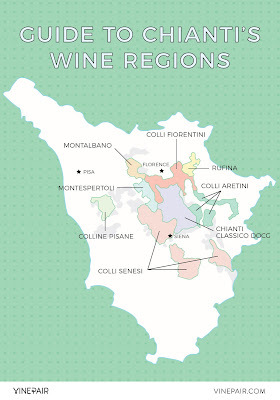 The region is divided up into 8 sub regions, the most famous being Chianti Classico. We were helping clean out an old friend's home (she is going into care) when we came across a most stunning bottle of Chianti Montebello. I traced it to its village (Certaldo) and what I assume was its commune (Montebello) but for a while could find no record of it on the Internet nor any pictures of that type of bottle. The bottle is obviously old but could find no date or further info as the front label is a little damaged. The intact neck label is not too informative. However a week later I had another look and saw the faded words Nello Gori. I googled that and BINGO! 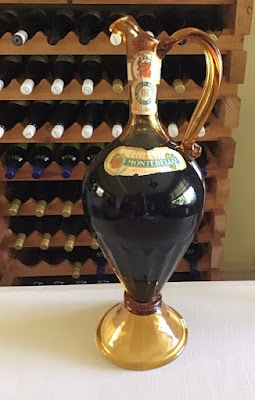 In the 1960s, Nello Gori and his son Alessandro purchased the il Pozzo agricultural company and started the production and worldwide export of Chianti wines. The passion for agriculture and wine was transmitted to the third generation, Gianni and Duccio Gori, the sons of Alessandro. They establish the 40ha Tenuta della Luia vineyard and winery in 1997. 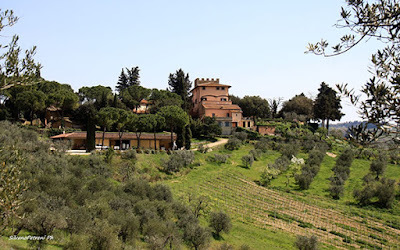 Annually they sell 2000 hl of bulk DOCG Chianti wine in tanks and 15,000 bottles of Chianti and IGT oak barrel aged wines locally as well as exporting to other European countries and the United States. I made contact with Gianni who asked me to send a picture. The bottle will stay with us as a bit of floor art by our wine rack, probably never to be opened. The wine has more than likely already gone 'over the hill' (Gianni agrees) despite bring well sealed with a cork and wax. But the ullage is around 5.5cm. That wine is still made today albeit with a slight name change. The Chianti Monticello was born about 40 years ago. Initially the name was “Montebello”. Afterwards it was named Monticello in honour of the small town in Virginia (USA), where Thomas Jefferson was born and where he planted some of the first vines in North America. It is the wine dedicated to the founder of the company, Nello Gori and it expresses the freshness and fragrance of the grape and tradition of Chianti. All in all this little investigative 'trip' made me look into the complexity of the Italian wine classification system again and was a nice diversion from our day to day lives. The name of the bottle is " CLEOPATRA " exported in Australia more of 50 years ago, the glass is handmade near Florence. Rose' wines are made from any red wine grape where, after crushing, the skins are allowed to remain on the juice for varying amounts of time. The longer the maceration, the deeper the colour and more complex the flavour. After draining the juice from the skins it is treated like a white wine with fermentation taking it to complete dryness or some degree of sweetness by stopping fermentation at predetermined residual sugar level. The wine is then marketed as a Rose' table wine or used as a base for making pink sparkling wines. On our trip to Rutherglen last year, we came across a few unusual Rose's. Rutherglen is well known for its fortified wines eg. Muscat, Topaque (formerly known as Tokay) and Vintage and Tawnies (formerly known as two Port styles). As a consequence of this, they grow a lot of grape varieties of Portuguese and Spanish origin. These are not generally used for table wines but there has been a trend to experiment with them for that purpose. 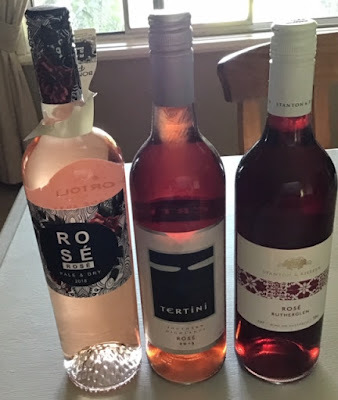 Some wines obtained during an intensive wine tasting trip can be disappointing many months later when opened at home, particularly those bought late in the day when judgment might be slightly impaired (wink, wink). But this one did not disappoint. Sure, it was quite different from other Rose's we were used to but on a hot 35°C summer's evening with an antipasto plate loaded with goodies, this cold wine went down a treat. We had also bought a red table wine made with a similar blend of 39% Tinto Cão, 26% Touriga Nacional, 17% Tinta Barroca, 14% Tinta Roriz and 4% Souzão which we have already tried and found to be excellent. The daughter went to an up market Italian restaurant in Brooklyn (NY) the other night and suggested I look at the wine menu. One was the very large selection of wine, all of which was available by the glass. This is highly unusual with most wine by the glass limited to a few selections. I wondered how they kept potentially so many open bottles fresh for any length of time. Most wine starts to deteriorate within days, even when kept under optimal conditions. There are numerous products on the market that purport to be able to do this from the humble air extractor pump (which is useless) to some really sophisticated equipment. At the top end are products like the Coravin. This tool works by pushing a long hollow needle through the unopened bottle’s cork. At the push of a button wine is drawn out through the needle and argon gas is pushed into the bottle from a compressed canister inside the device. Trials have shown that wine stays in great condition for two weeks or more. But there are some drawbacks. It’s a bit fiddly, it only works on corked bottles not screw caps and it is expensive at around $A450 although a business probably wouldn’t shy at that price. The other surprise on the menu was the large selection of Orange wines. For this Australian, it immediately meant wines from the Orange Wine Region of New South Wales but knew this would be highly unlikely for a USA restaurant. And it couldn’t be citrus wine. So a bit of investigation established that Orange (or amber) wine is white wine made by the same process as red wine. Instead of crushing the grapes and separating the juice from the skins before fermentation, which is normal for white wine production, the juice is fermented on the skins and left to macerate on them for an extended length of time. As a result orange wines are more tannic and very flavourful having extracted tannins and phenols from the skins. They also have a mouth feel closer to that of red rather than white wine. Certainly the colour is quite different being between deep rouge and honey. And they are not too difficult to match with food. How I could have missed knowing about this style over so many decades is a bit embarrassing. They have been around for many thousands of years originating probably in Georgia (the country, not the USA state). Many Australian producers have started to embrace this style and local restaurant menus are beginning to have a few offerings. However the best come from the border region between Italy and Slovenia. We had a reasonably quiet 2018 travel wise. There were no overseas trips, just a week away in Melbourne, a long weekend in Port Macquarie to see Stirls and his new home and four overnights in Canberra for a quilt show, Sydney for a medical appointment, Bowral to see the daughter on a flying visit from New York and Brisbane to say goodbye to my oldest friend. Life on the farm was dominated by the drought. The pasture stopped growing very early and the dams were drying up. The creek stopped running for the first time in our memory. We were forced to begin feeding the cattle a lot earlier than normal. With a shortage of hay across the country, and what we could get at $30 bale, it was an expensive exercise. On top of that we had severe out of season bush fires to deal with. But early summer saw some rain come and there was a little relief. Weather events have been quite severe. Storms have brought high winds and hail not to mention damaging lightning strikes. Looking around the world at other severe weather events it’s hard to deny climate change is with us. 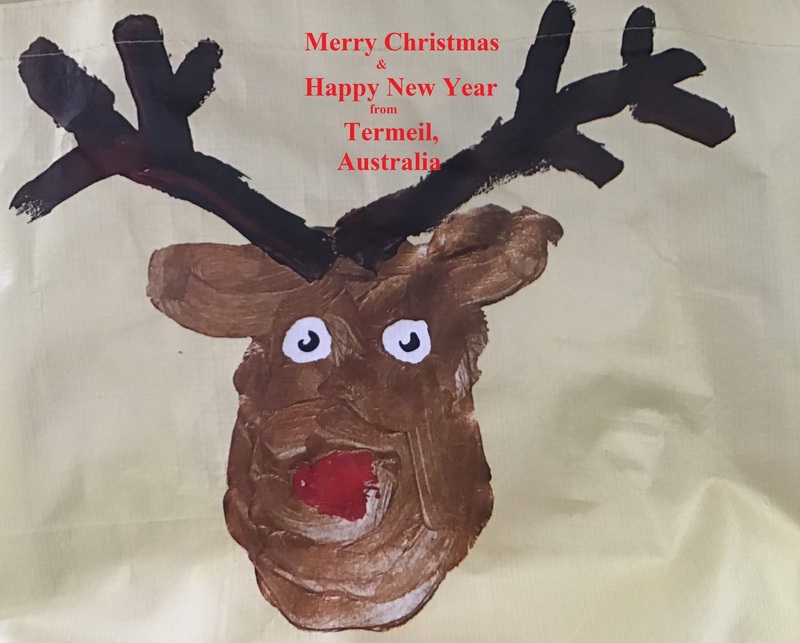 Politics in Australia produced another chaotic year. The ‘do nothing’ conservative government changed prime ministers again in the most shambolic way. Forced into Royal Commission into Misconduct in the Banking, Superannuation and Financial Services Industry that they didn’t want, voting against it many times, it was established that our major financial institutions had been ‘very naughty’ for a long time. No one responsible will spend any gaol time of course. Big business is a protected species under conservative governments. The Royal Commission into Aged Care Quality and Safety currently running is expected to produce disturbing findings. Our brutal treatment of refugees continues to be a stain on the national reputation. We have to go to the polls sometime before a May this year and there is little doubt the conservative coalition faces oblivion. The only saving grace is that we are not as big a circus politically as our ally across the Pacific. The USA appears to be an elective monarchy rather than a democracy. It’s just crazy town there. Sporting wise our state and national rugby teams were again disappointing. There is no light at the end of that tunnel and with the Rugby World Cup looming it will be tough to watch them struggle. Our national cricket team was involved in a disgraceful ball tampering scandal. A clean out of the culprits hopefully will change the team culture. The test matches against India over the last months have been encouraging that a change in attitude is in place. Australia produced another world champion surfer, Stephanie Gilmore. This is her 7th world title! At home the co driver continued to quilt, dye, sew and help alcohol ink do its magic. For me, grape growing continued with its usual problems but an influx of kangaroos, due to the drought, made things a little more difficult. My three year weed eradication program has produced great results. A minimal yearly autumn clean up from now on will be all that is needed. So, for 2019 we have a trip to the USA planned, mainly New York and South Dakota. Trying a new route this time through Houston. That means an initial longer flight of 16 hours out of Sydney but a much shorter second leg. And it was quite a cheap ticket. We are looking forward to catching up with family and friends. Mike Carlton is well known media personality and author in Australia. He is a few months older than I am and we have pretty much the same outlook on life as well as similar political leanings. He is the son of a protestant mother and a catholic priest (yes really!) and was, at a very young age, a correspondent for our national broadcaster, the ABC, in Indonesia and twice in Vietnam during that war. He moved onto commercial radio both in Sydney and eventually London and later wrote provocative columns for the local press until he fell foul of the Jewish lobby for his criticisms of Israel's policy in Palestine. He then quit and retired to write Australian naval history. On Air is an autobiography which covers his parents romance and his early childhood, his overseas adventures, the trials and tribulations of being a famous media personality as well as many anecdotes on the various good and bad people in the public eye, both media and politics, we in Australia all know. It is a witty and informative read but maybe really only one for those who know of him. For me a 'couldn't put down' and read in three days. The Long Paddock was a freebie on Amazon. The synopsis gave the impression it was a mostly about small Australian town country and life on the land. In reality it was a long drawn out 'will they or won't they' romantic novel with a rural sub plot. Chicklit I think they call it. I finished it to its inevitable happy ending....but only just. The Greenland shark lives in Arctic regional waters at great depths (1200-1500m) and can live for up to 500 years. As an adaptation to living at depth, it has a high concentration of trimethylamine N-oxide in its tissues, which causes the meat to be toxic. This toxicity causes the consumer to appear drunk. Shark Drunk is a translation from the Norwegian. The author and his artist friend Hugo Aasjord set out over a number of seasons in a small rubber IRB in the Lofoten Islands region of Norway to catch one. But this book is more than a simple fishing trip saga. The author sets out to understand the ocean from every possible angle, drawing on poetry, science, history, ecology and mythology. It is also a history of Norway's northern region, its fishing industry and the lives of the people who populate the small isolated villages dotted along the spectacular coastline. I really liked this book but be warned, it is extremely long. The author of Love and Other U-Turns, Louisa Deasey is the daughter of Australian literary figure Denison Deasey (more about him in the last review). She has worked as a free lance magazine journalist, editor, copywriter and now author. This book tells the story of her giving up a stable but unfulfilled city life, selling all her possessions, for adventure on the road, living out of a car, with an itinerant comedian, Jim, with whom she has fallen in love. This book documents that journey. Jim is well educated and comes from a good family but has decided that life on the road in country Australia is for him. His humor is very crude (so crude he is banned from most city venues) so he finds his audience in pubs and bars in country Australia mainly in the mining towns and the outback. Paradoxically he is also a clown and performs for kids at country schools. The couple travel the length and breadth of Australia sometimes driving many hundreds of km without a break.They stay at some of the most awful accommodation in some of the most confronting places in the country eg. Kalgoorlie, while meeting some of the strangest, roughest and fascinating characters who inhabit these places. And all the time Louisa keeps in touch with her literary world eking out a living via her trusty lap top and not so trusty rural Australian internet connections. Does she and the relationship survive? Read it to find out. There was some eye opening stuff in this book, even for this Australian. If you want to know about parts of the country that are not in the travel brochures this one is for you. Denison Deasey died when Louisa was nearly seven. He was the father she never knew. Her mother had little to say about him and her godmother (bizarrely her father's first wife) had lost contact. He had been characterized by some as a failure or a dilettante, who squandered money and failed to finish anything he started. In love with life but unable to benefit from it in any conventionally constructive way. 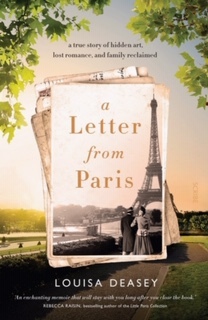 But a Letter from Paris with a mysterious reference to a relationship her father had with a young French au pair in post war London encourages Louisa to find out more about him. This book documents her journey of discovery, filling in the gaps of her father's life, loves, travels and achievements. She spends hours in the nation's libraries searching through their badly organized archived files slowly piecing together a portrait of this man. Then she literally follows in his footsteps travelling to France to meet people who were associated with her father and his work. He turns out to be a great deal more than 'just a taxi driver'! A really fascinating story, well written with passion that jumps out at you from the pages. The daughter’s grandma died so she made a quick trip ‘home’ from New York and stayed with her mother on the Southern Highlands. We went up that way to see her and catch up over lunch. 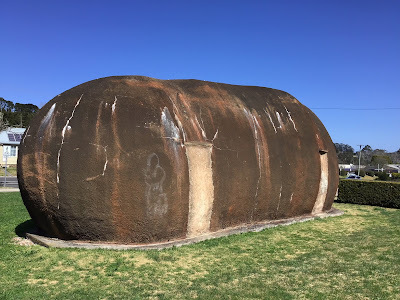 We drove to the small historic village of Burrawang from Nowra on the coast via the Cambewarra Mountain pass into the Kangaroo Valley and then up the Barrengarry Mountain pass to the Southern Highlands. Both passes are narrow and winding with many hairpin bends and are quite steep in places. It can be a bit of a challenging drive but not too much if you take it easy. A 10℃ lower temperature at 700m above sea level on the highlands made for a pleasant change from a very unseasonably hot day at home. The Burrawang village hotel has been refurbished and it serves great food in its lovely back garden. We spent the night in Bowral, one of the main towns in the region. The area is a popular weekend getaway for Sydneysiders. Being at altitude and experiencing relatively cold winters they are able to grow lots of exotic cold climate plants like bulbs. Bowral is famous for its tulip festival. Plenty of daffodils were already in flower. The co driver did some quilt store shopping before we headed out to eat. We came across, by chance, the Eccetera Trattoria and Pizzeria. For entree I had marinated fried sardine fillets Sicilian style served with lemon and aioli and the co driver beef fillet carpaccio, rocket, apple, balsamic, parmesan and crostini. For a main we shared a delicious pizza washed down with an Italian Pinot Grigio. Some of the best Italian food we have had in Australia. Next morning we found the Gumnut Patisserie for breakfast. Pastries to die for and great coffee. After a walk around town to shed the kilojoules, we headed a few km down the road to Berrima to a quilt store well known to the co-driver. Berrima was established in the 1830s and is widely recognized today as one of the best preserved examples of a Georgian village on the Australian mainland. The sandstone gaol, recently reopened for low security inmates, and courthouse are significant historic buildings. Then it was time for the return journey. We decided on a different way stopping at Robertson to see the Big Potato. Now, some Australian towns build 'big things' their areas are famous for as tourist attractions. These include a merino ram, prawn, lobster, banana, pineapple. You can see a selection here. The Robertson one has to be the worst. Despite all efforts to have it removed the locals want it to remain. Its alternative name is the Big Turd for obvious reasons. Then it was down to the coast via the Jambaroo Pass, another winding and much narrower road than the one up. Trucks and long vehicles are banned from using the road. Thankfully there was little traffic and the trip through the dense temperate rain forest on the eastern side of the escarpment was wonderful. The road eventually ended up at Kiama on the coast and from there the highway south to home is very familiar territory. A nice night away. Great to see the daughter and we will catch up again in New York mid next next year. 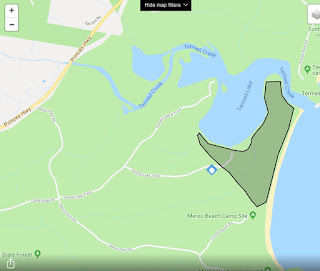 Willinga Park is an 800 ha (2000 acre) property behind Bawley Point that has been turned from a run down cattle farm into a state of the art equestrian centre. Not everyone welcomed this development and there was considerable disruption to the amenity of the area during its construction, which continues, as well as on event days. But it has provided a much needed boost to employment in the area and seems to be a little more tolerated as time goes on. For the last week they have had on display the outdoor work in the Sculpture on the Clyde exhibition. The indoor work is in Batemans Bay, a 25 minute drive to the south. We went along on the first day of spring which turned out to be a warm sunny day. Much of the area has been beautifully landscaped with numerous native plants and trees as well as a water features. As with all properties in our region the drought has taken its toll on the pasture areas which are sadly very brown. Coffee, picnic hampers and blueberry ice cream from the Clyde River Berry Farm were available. We spent two hours walking the suggested route which had a total of 53 works on display and then stopped in the shade of some huge spotted gums for our soft serve fix. As with all sculpture, some resonated and others didn’t. Work ran the gambit of abstract to quirky, examples of which are shown below. 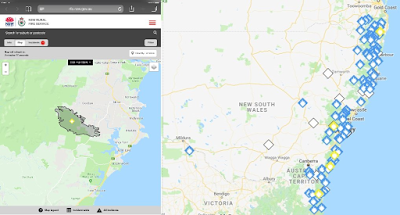 On Saturday I noticed on the ‘Fires Near Me” app (an essential for rural living) there was a bush fire to the north and west of us in the foothills of the Budawang Ranges. It was in rugged but not inaccessible country and both National Park and RFS firees were there. The word was the fire was ‘under control’. On Tuesday night however the wind got up and by the next morning it was gale force from the north west gusting between 60 and 100km/hr. The Mt. 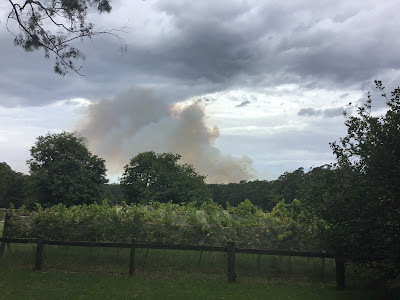 Kingiman Fire (as it became known) came howling out of the mountains towards the town of Ulladulla and its southern suburbs. We could see smoke to our north but thankfully we were not in the direct path of the fire. An emergency situation was declared and rural properties to our west plus the suburbs of Kings Point and Burrill Lake were ordered to evacuate. The fire was spotting kilometers ahead of itself into those suburbs. The town was filled with smoke. So water bombing helicopters were in the air (how difficult flying conditions were in that wind?) and hundreds of Rural Fire Service volunteers were on the ground. It was a nerve racking day. By nightfall 1500ha (3750acres) had been burnt but there had been no loss of life or property. The RFS as usual did an amazing job. The wind dropped overnight and allowed some containment. But today winds are predicted to be moderate so some flare ups can be expected. The drought has made New South Wales a tinderbox. The fire map shows how many are burning along the entire coast line. No rain is predicted for the near future so we will have to be continually on alert. For two days the winds dropped which allowed firefighters to contain the fire and back burn. However yesterday the winds got up again and we went into another emergency status. The fire broke through containment lines and continued its journey to the coast. Somehow it was again contained by the efforts of those on the ground and in the air. But it came at a cost. Sadly one of the helicopters crashed killing the very experienced pilot. Today is also predicted to be windy. Unless we get rain soon then I think this will be the daily pattern. So far the fire has burnt out 2200ha (5500 acres). The fire is still smouldering but under control. The forecasted rain that would put the fire out has not materialised. Light ineffective showers have been the order of the day. The bushfire season has been officially declared a month early. This summer could be nasty.